You don’t have to call a repairman to fix everything that goes wrong with your appliances. In fact, you can save a lot of money repairing your appliances on your own. Consider tackling these projects yourself. If this won’t come on, try cleaning around the igniter (a ceramic nub). Then check to see if the strike plate is sealed. If your electric burner won’t heat, pull it out and push it back in. If it’s wiggling, bend the burner prongs to help it stay tighter. Instead of using the self-cleaning function, Air nation recommend cleaning up spills as they occur and using drip pans to catch spills. 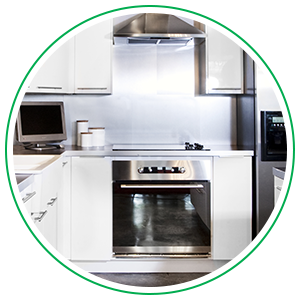 Get the leading cooktop range repair with appliance technicians you can trust at Air Nation! At Air Nation, our skills span beyond HVAC and we mend and install a myriad of home appliances. What exactly is a cooktop range? We know, this can be a confusing topic — what is the difference between a range, cooktop, and stove? Aren’t they one and the same? To clarify, stove and range can be used interchangeably. These appliances make up one unit that includes a cooktop that implements a heating source including electricity, gas, or induction, while below is the oven. A range is one of the most common household appliances in the US, and really, it’s just an all-in-one cooking solution. As always, there are exceptions. While the most common is an all-in-one component that includes a cooktop range and oven, you can have a single countertop cooktop range by itself, while the oven is mounted nearby to the wall, but they’re not exclusively together as one piece. Why is a functioning range top necessary? Our modern-day comforts allow us to live a life of convenience and ease, as experienced in a properly functioning cooktop range. When the range, or part of the range, is out of commission can cause a disruption to our everyday lives. Perhaps you want to bake cookies and it’s been over 20 minutes for your over to preheat, this is an issue that not only affects the quality and consistency of your food but it’s wasting energy, ultimately driving up your monthly utility bills. Similarly, maybe it’s your cooktop — a burner won’t turn on or the electric coils aren’t heating up. This causes a real issue early in the morning when you’re hosting a brunch at your house and the eggs can’t be made! A functioning range is needed to carry out simple tasks that can be taken for granted until something does happen and they go out! Ensure a properly functioning range with routine maintenance and expert appliance repair with us! Schedule a range service today!